Utilising our latest Slot & Lock connector technology and tried and tested aluminium tubing, our new Harrod Slot & Lock® Bean and Pea Support Frames will give years of reliable support to your climbing legumes in the garden. Perfect for Runner Beans or Sweet Peas! 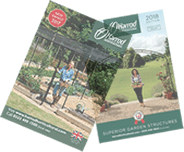 Buy 2 or more Frames & Save £5 on each! 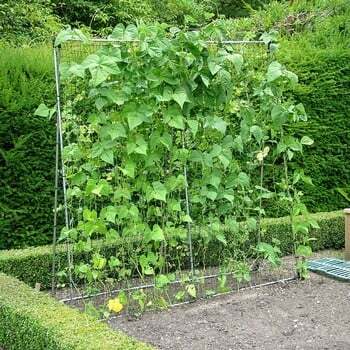 The Harrod Slot & Lock Bean & Pea Support framework uses durable 16mm diameter aluminium tubing along with our Award Winning Slot & Lock connectors to securely hold the frame in place, easy to assemble and also easy to dismantle for winter storage. 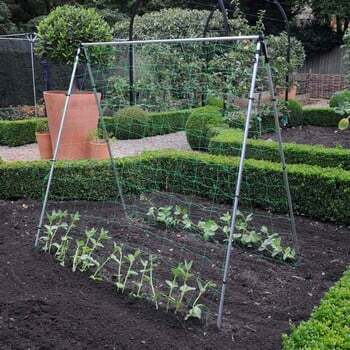 Available in 4 lengths (1.03m, 1.65m, 2.26m & 3m) these supports are ideal as runner bean frames and are supplied as a complete kit including all framework, netting and braces for extra rigidity. 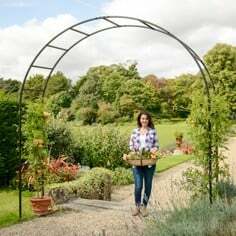 The bean support has been carefully designed and manufactured to create an easy to assemble, strong frame for supporting your bean, pea and sweet pea plants throughout the season. With only 7 poles and a few connectors and screws, this should have been an easy item to construct. It was not. Even though I bought the smallest bean frame it really needed two tall people to hold the various bits in place whilst trying to set and tighten the bracing pieces. The hinge pieces in particular were awkward to hold in place. In retrospect the instructions are clear but they are not at all clear when trying to follow them at the time. At my first attempt I managed to misplace the hinges so that the apparatus opened like a door! 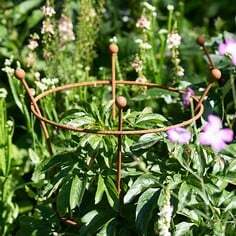 When finally erected it is a fine, smart and strong-looking frame; infinitely better than my more rustic attempts using ever-aging bamboo poles and string. 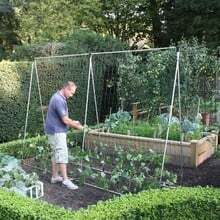 It was not until I read the instructions and saw the illustrations that I realised that this frame was designed for a 4ft raised bed. I have only 4 x 2 ft available, similar to the illustration in the catalogue. 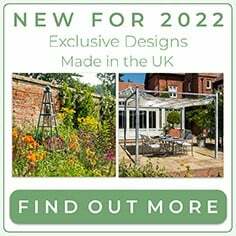 I wonder how stable it will be when coated with a runner beans and subject to our north-easterly winds? 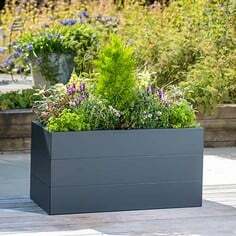 Despite my comments I would have no hesitation in buying another one and at least I would be aware of and prepared for its little idiosyncrasies. Assembled it on it's side,flat on the lawn, with the other side about 3 feet apart at the base. 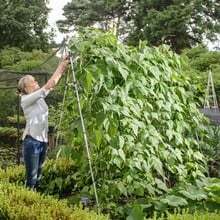 Then took the 3 horizontal lengths off and held the top of the apex in place with two 6 inch lengths of 15mm tubing so that it could be stored in the greenhouse till needed. 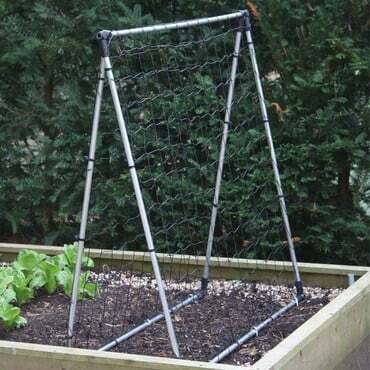 Quickly assembled again when the beans were ready to be planted out from the greenhouse, used 3 reusable ties on each leg, and net pegs preferred at the base. 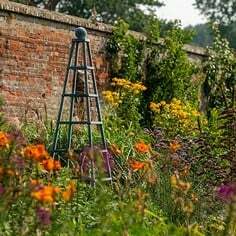 Long stakes look sturdy enough to hold the frame steady. 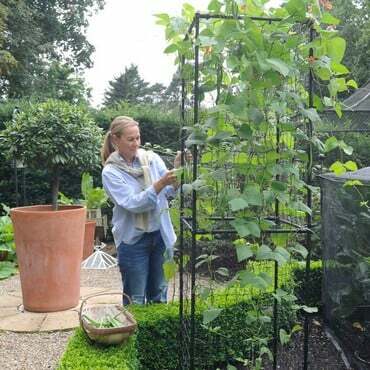 I have runner French beans on the north side and sweet peas on the south. 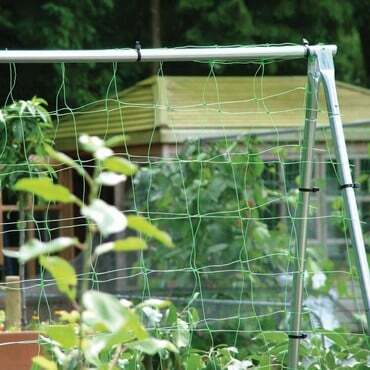 The net is very sturdy, and the frame will be easily stored in the greenhouse over the winter. I bought 2 supports this year. The other was a lot cheaper and easy to assemble but nowhere near as robust. I would choose the Harrod one next time with the following proviso: you need 2 people to assemble it and one of them should be well over 6ft tall. I am not experienced with DIY but managed to work it out but had to think about it a lot. Best done on the drive and to partly screw in all the connector screws before putting the pieces on (but after putting on the braces). 'Best Buy' - KG Verdict - This is a sturdy and well-designed frame that is built to last. 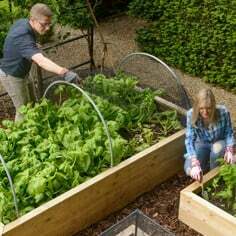 Once up it is best left intact, but it is light enough to move around the plot to follow your crop rotation. 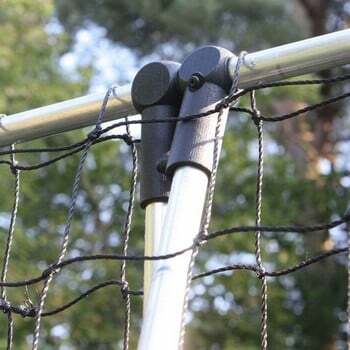 The framework uses durable 16mm diameter aluminium tubing along with Slot and Lock connectors to securely hold the frame in place. Supplied as a complete kit, including all framework, netting and braces for extra rigidity. KG Verdict - A strong performer for peas and Beans. 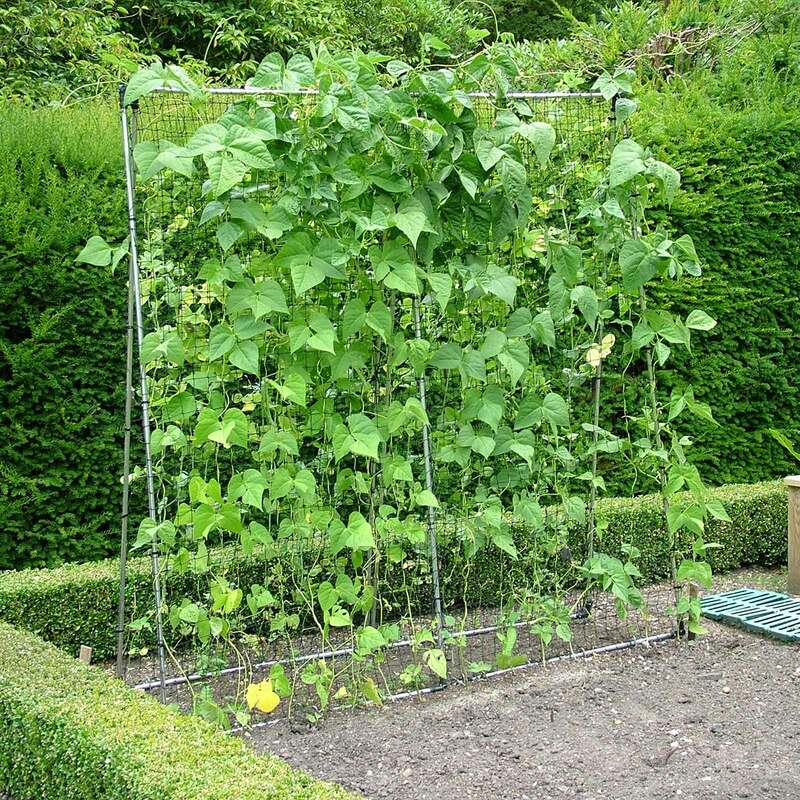 A tall , strong, frame for peas and climbing beans. 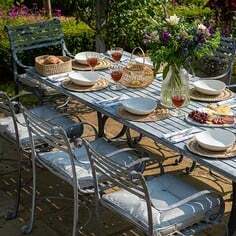 The assembly takes a little while, but the system is simple and the end result robust. 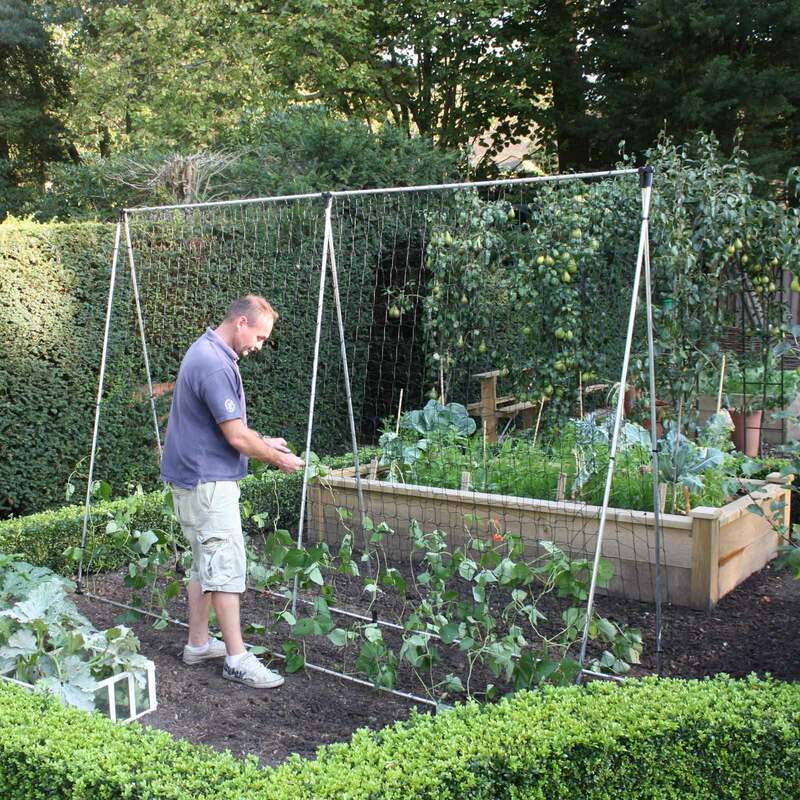 The frame fits neatly into a 1.2m (4ft) wide raised bed and I used extra ties to hold it in place. 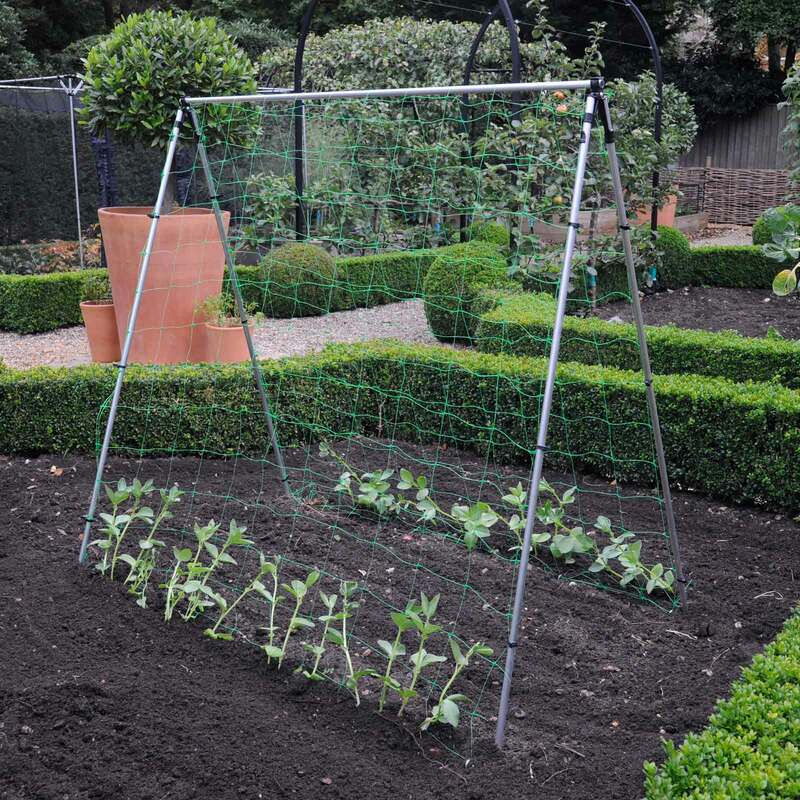 Sweet peas may need a bit of directing to get them started, but tendrils soon grip the net after that. 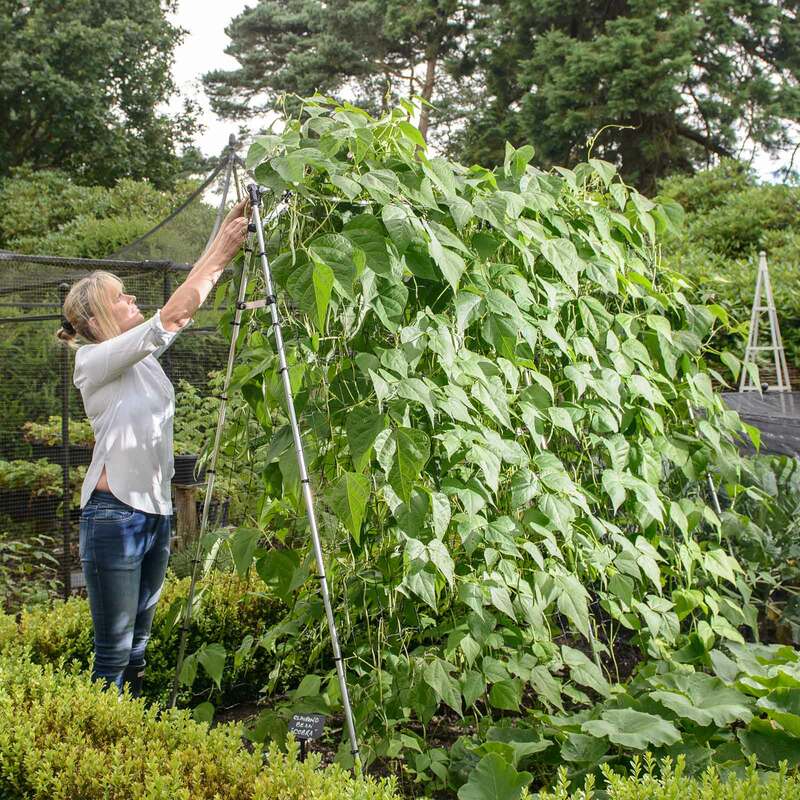 Beans have plenty of support as the plants climb. 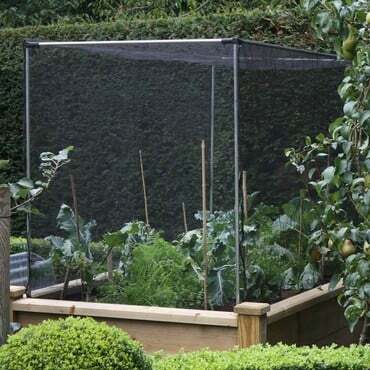 This system gives an even distribution of foliage on both sides.